This muddy play date is from Erin at Bambini Travel, who is sharing her muddy fun on Mommy Evolution today and giving us the inside scoop on how to turn mud into the ultimate toddler playdate! To date, muddy play dates are still one of my all time favorite activities. Truthfully, I hate big messes and this is one of the biggest messes my kids have ever made, but it was worthwhile. All kids need sensory play and Summer is a great time to explore some new messy activities. You can take your play outside and then hose the kids and play space down afterwards. We did this on the cement patio in our backyard. I removed all of the patio furniture so I didn’t have to worry about any of it getting dirty. Gather all of your materials. Spread the bowls, cups, shovels, etc around the space. 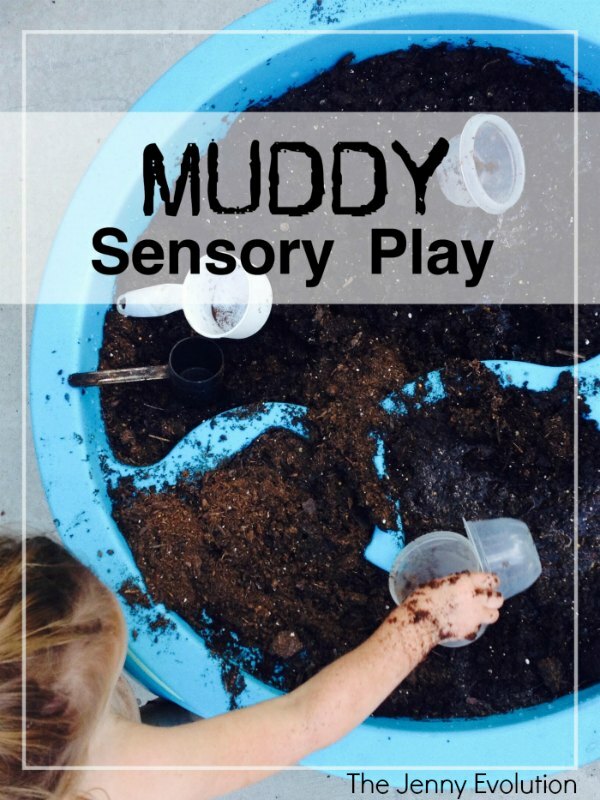 Pour about half of the dirt into your sensory table. I set the rest aside and we added more dry dirt to the table and bigger bowls later. Fill some of the smaller bowls with water. Create a clean up strategy. The activity itself is simple. Invite your kids outside to play. My kids are not at all afraid to get messy, so I took off everything they were wearing except for their diapers. They will likely be quick to figure out that they can pour the water into the dirt and it turns into mud. Let them explore. Ask some questions (ex.”how does that feel?” “tell me about what you’re doing there!”) and narrate some of their play (ex. “You’re carrying that big bowl and it looks very heavy!” or “I see you piling the dirt in a tall mountain”). Help if they ask for assistance, add more dirt or water if it seems like it is needed, and observe. If you have a child that is more hesitant to get messy, don’t be afraid to step in and play next to them or model some ideas for play. Using a spoon or cups to scoop the mud might be less stressful for a child who doesn’t like to get their hands too messy. The most simple activities are often the most meaningful. Our three kids, all around the age of two, played for over an hour together. Their attention span, cooperation, and exploration was remarkable. Science: How the water and mud interact and effect one another. Math: Exploring volume and capacity with different sized containers. This will be messy. It is a rare child that can play with mud without getting covered in mud. The patio, materials, and children were covered in mud. I say this not to scare you, but to make sure that you are prepared. Relax and enjoy the play knowing that you have a clean up plan. Scoop as much of the mud as you can either into the sensory table, buckets, or the garden. The kids can help with this. Use the hose to spray off the surface of your patio, driveway, etc. Clean the space first, then the kids. If you clean the kids first they will just keep getting dirty again. Hose off the children. Our kids thought this was one of the best parts. A bath is recommended at this point. You could get by with hosing them off really well, but a nice warm bath is easiest. Either wrap your child in a towel and carry them to the tub or for two I used to slide them in a laundry basket to the bathroom. In the bath, rinse off again before you put the plug in the tub. Let the muddy water drain out and then start again with fresh water for a soapy bath. 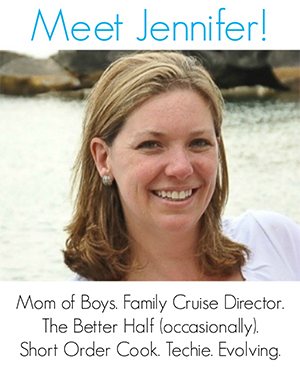 Erin Buhr is an early childhood educator, freelance writer and mama to twin four year olds. She is originally from the Midwest, but right now she lives in Mississippi where she enjoys spending time outside with her family and traveling to new places. Read more from Erin on www.bambinitravel.com. This post is part of the Sensory Summer series, hosted by Mommy Evolution in partnership with The Sensory Spectrum. I encourage you to follow us all summer and visit our Sensory Summer series page to get the latest sensory fun for your kiddos! This would make a great play date – especially at someone else’s house, lol! But look at those smiles – that makes it worth it! HA! Definitely at someone else’s house, right? I remember making mud pies in the back yard and absolutely loving it! My kids love playing in the mud. My older two didn’t get the chance to because mommy was afraid of dirt but these last two have mud kits and I am glad that my older two opened my eyes to the fun that they could have had. My kids would love this!!!! I need to do this bc they are always trying to play in the mud anyways so this would add to the fun! I love the pic of your kids! So funny! This is such a cheap thing to do also! Definitely a cheap but messy activity. I remember making mud pies in the backyard as a kiddo and loving it. What a fabulous activity! 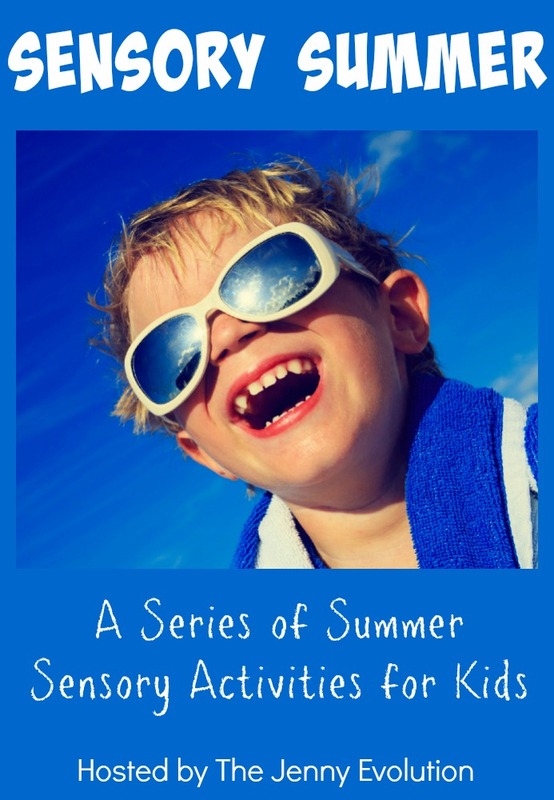 I love that it’s the Summer of Sensory activities on your blog! I need to read over them. Thanks for joining us on the Sunday Social! Oh I know my kids would have a blast with this sensory play. Nothing like getting a little dirty to make activities fun. Thank you for adding this to The Sunday Social Linky Party. I remember making mud pies with the kid next door as a kid… definitely loved every minute of it!